Depending on the Druid tradition, the role of the ancestors can be vital, interconnected, and critical to one’s ceremonies and meditations. In other traditions, the ancestors may not be mentioned or honored at all. Each tradition is valid although it may be different for each person. What is an ancestor exactly? Ancestors do not necessarily have to be the direct blood kin of an individual, but can be adopted local spirits or those who occupied a space prior to us (Orr, 1998). This includes not just humans, but animals and plants. This view of who can be an ancestor really opens up the paths in which we can work and the various forms of wisdom we can access. We are not limited to just our own family members, but can discover animal wisdom and plant mysteries. Ancestral practices vary far and wide the world over. Humankind has a long history of varying practices of care for the dead, the roles of spirits, and the place ancestors occupy in the lives of the living. In 2015, we have our own contemporary forms of Druidry. While it’s nice to consider the origins of the Druid Revival of the eighteenth to twentieth centuries and where that fits in (Greer, 2011), each of us has our own contemporary path of Druidry we walk. This may consist of strict adherence to the outlines in the manuals and training program, or we may simply acknowledge the path of the sun and orbit of the moon while digging our toes into the Earth’s soil. Either way, the ancestors can have a place for each one of us. Ritual burial is perhaps the oldest form of acknowledgment and significance given to the honored dead and ancestors. The examples in this section serve, in part, to demonstrate how ancestral practices predate modern humans and recorded history. The oldest known intentional ritual burial dates from around 50,000 years ago, a Neanderthal skeleton that was found in a cave in southwestern France in the early twentieth century (Than, 2013). This substantial find indicates that early humans had turned their minds to the ancestors long before cities, writing, and domes- tication of animals took place. Other examples of ritual burial can be found in the Valley of the Kings of Egypt, the barrow mounds of Europe, the Caves of Petra, the hanging coffins of China (Riddle of the hanging coffins, 2013), and the Taj Mahal of India. They display honor for the deceased and help the departed soul make a smooth transi- tion to the realm of the ancestors. They provide the grieving family members and relatives of the deceased time to mourn and show their grief in a certain way. Highlighting the interconnectedness between life and death, performance of funeral rites not only eliminates the fear of death in the mind of the performer, but also encour- ages virtuous living (Sahoo, 2014). In some ways, funeral rites are more for the comfort and edification of the living than for the dying. Besides the transitory process, the rites console the living relatives or kin and help them turn their minds to bettering their lives and considering what kind of legacy they would like to leave behind once they pass on. The origins of formal ancestor rituals may date as far back as 7000 BCE. In May 2014, a collection of spirit masks went on display at the Israel Museum of Jerusalem dating from this period.. Dr. Debby Hershman, one of the experts working on the exhibit, believes the masks were “used as part of an ancestor cult, and that shamans or tribal chiefs wore the masks during a ritual masquerade honoring the deceased” (Zion, 2014). Other examples of masks of the dead can be seen in museums, including important historical figures such as K’inich Janaab’ Pakal from the Maya polity of Palenque, the death mask of Immanuel Kant at his tomb in Kaliningrad, Russia, and, most famously, the death mask of Tutankhamun from ancient Egypt. Connecting ancestors with objects such as masks is not a new concept or practice. In Africa, reliquary forms of masks and dolls are a specific, directed way that some cultures use to strengthen and build bridges to the realm of the ancestors to gain their wisdom (LaGamma, 2007, p. 34). Voodoo dolls sometimes contain spirits of the dead (Alvarado, 2009, p. 41). The use of dolls can also be seen in the Russian folk tale “Vasilisa the Beautiful,” which includes the famed crone Baba Yaga. Vasilisa has to perform house, farm, and other chores while with Baba Yaga. In the process, “she learns how to worship and take care of the ancestral spirits and stand vigil for the well-being of the family. . . . Like the goddess she [Vasilisa] represents, she traveled alone, without the need of a mate, accompanied only by the amuletic power of the ancestral spirit doll” (Hubbs, 1988, pp. 49, 51). Working with the ancestors includes duties of caring for ancestor spirits, shrines, and holy sites. Sometimes simple honoring of the memory and death dates takes place. At other times, elaborate rituals and altars are necessary for specific cultural practices for the dead to properly perform their functions (in some cultures, the dead help the living in various capacities). In ancient Rome, Christians participated in ancestor worship: “The dead in their resting place were worshipped also, conceived of as minor deities—the divine Manes.” Offerings varied, but most often alcohol was the preferred choice. Various foods were given as well along with the alcohol, which served to help the dead have a “tranquil existence in the Beyond” (MacMullen, 2010, pp. 602–603). The living wanted to appease the dead to help them to rest well, so that they would leave the living alone. Such practices were done out of respect and consideration that one day, the person now caring for the ancestors would join them. By passing the tradition down among the living, the next generation would help the newly dead to rest well. Feeding the spirits was also commonplace across cultures. The practice not only was ongoing in ancient Christian Rome, but China, in Africa with voodoo dolls (Alvardo, 2009, p. 41), and in Santeria (see Wippler, 1992)). The dead have played important, sometimes deified roles in the lives of people depending on the culture. “Throughout equatorial Africa, exceptional ancestors were selected as effective advocates to the divine on behalf of their extended families. Relics intimately connected to those individuals were held in a vessel whose contents were the focus of acts of devotion” (LaGamma, 2007, p. 34). This idea resembles the veneration of Christian saints, who received sainthood for various special reasons, usually involving some divine act or way of life or death. These saints act as intermediaries between humans and the divine. The Orisha Chango is found in this same position of elevation. Originally a warrior king, he was deified and became one of the major ruling Orishas of Santeria (Wippler, 1992, pp. 72–73). Ancestor worship continues to be an important part of social structure in southeastern Chinese society: “the idea of ancestors and the worship of ancestors constitute an important basis for the perpetuation of Han Chinese social structure through the clan” (Gouqing, 2005, p. 57). Though the worship is central in many areas to the culture, it isn’t necessarily approached as official religion. Debates about the place of ancestor worship continue among Christian Chinese. These two seemingly opposing practices combine in a syncretic dance of Chinese culture and heritage. Lung-Kwong Lo (2003) identifies ancestor worship in China as a “diffused religion,” that is to say, it “is considered as ‘a religion having its theology, cultus, and personnel so intimately diffused into one or more secular social institutions that they became a part of the concept, rituals, and structure of the latter, thus having no significant independent existence.” This takes the form of things such as superstitions and beliefs on a daily basis that people practice. They may or may not be aware of their origins because these origins are hidden in the structure and fabric of everyday life around them. Lo (2003, p. 35) continues, “in other words, ancestral worship has all the primary qualities of religion diffused into the institutional structure, including belief in the souls of the dead, their power influence the living morally, physically, and the need for perpetual sacrifice by the descendants.” (p. 35). So far, examining Chinese, Hindu, and African traditions about the ancestors reveals a common theme of guidance, support, and wisdom being handed down from the dead. The role these ancestors play can be loosely or tightly woven into the structure of ritual, extending from proper burials to full shrines dedicated to the dead family members. We now turn to examinations of ancestor practices within Druidry. Closer to home, there is no historical evidence that the ancient Druids practiced ancestor worship, though speculation exists. Ronald Hutton, discussing the work of William Stukeley, a major forerunner of the revival Druidry movement in the eighteenth century, mentions ancestor worship in Continental Europe (Stukeley’s interpretation of idolatry), but Hutton (2009, p. 92) states that Stukeley admitted that the Druids never practiced it. Even so, Stukeley never produced historical evidence. Ross Nichols claimed that the Long-Barrow people lived with their dead in the barrows around ancient Britain: “the realm of the spirits of the ancestors, which was cultivated rather more by the earlier long-barrow people, who revered and lived with them as it were, with the great burial-earth temple open” (1990, p. 201). In such a case, anyone living near a grave could be seen as living with the dead. Though we have no documented connections to ancestor veneration or worship among the ancient Druids, a certain amount of influence would come from the culture. With teachings and myth heavily based in oral tradition, each generation passed down the knowledge from the teachers and those gone before, forming a link to the current generation who were living. This unbroken link would have been a vital but fragile component of the oral traditions and memory of the culture. Any interruption, such as happened later in history, would break the link, dissipate the memory, and subvert the tradition. Even though we have little evidence of the ancient Druids’ work with the ancestors, many modern Druids and Druid orders engage in this work. Connecting with the ancestors harkens back to a simpler way of life in respect to technology, but more difficult in terms of survival, yet a way that is more interconnected to the world around us. It is common for those approaching ancestors or their veneration to feel the call of the kin or of the blood. This feeling or calling is rooted deep inside, almost coming from the very DNA that makes up an individual. This call pushes people to explore other sides of themselves, other cultures, and ways of viewing the world. The call positions people to reexamine their current values and ways of living, and guides them down the path toward a more centered life. It leads them away from prevailing social structures that often teach dominance over nature, and into individuality, local movements, and ethnic pride (Carr-Gomm, 2002, p. 44). Once we gain access to the realm of the ancestors (which is our right) and to their stored wisdom, the wisdom of the universe, we have a responsibility to follow what is given to us. Otherwise, what is the point of going to the honored dead and seeking their advice, if we then don’t follow what they say? Usually when we are given advice or if theyintercede on our behalf, it is for the highest good and benefit. In this way, we become the wisdom keepers of the ancestors (Mann & Sutton, 2000, p. 69). Connecting to the ancestors can come in many ways. The dead are often connected to objects. A doll, mirror, chair, ring, or any other item that was special to them can contain their energy and imprint after death and are perfect for ancestor shrines and altars. They can create direct connections to those who have passed on. Thus far I have discussed history, culture, and practices to begin laying a good foundation of importance, context, and applications of cultural practices. Now that you have the information, what do you do with it? One way you might use it is to build an ancestor shrine. How do you build the shrine or altar? Where do you place sacred items on it? How detailed should rites be, and how often should you conduct them? The answer to all of these is that it is up to you. The basic definition of a shrine is that it is a place where the ancestors are honored and remembered. It does not usually contain any practical workings such as a ritual, but rather is a place to go, see their items, look at their pictures, and give thanks or communicate with them, much like a public memorial of an important figure. An altar, on the other hand, is a bit more involved than a shrine, a place to conduct magical rites or workings to accomplish a goal. While an altar will have similar things such as pictures, objects, statues, and so on like a shrine, the altar goes a few steps further toward accomplishing one’s will (Greer, 2014, p. 53). Sara Greer’s article “Devotional Practice” (in volume 1 of Trilithon) is an excellent source of information for developing your own practice. The following are some suggestions for building a shrine or altar and getting into the prac- tice of working with the ancestors. Depending on the time or space available, a shrine may be the only option. If you have a dedicated space for ritual, setting up a working altar could be the better choice, especially if you plan on actively working with the ancestors to accomplish a goal. It is up to you to decide how much time to invest in conducting rites or remembering the honored ancestors. A skull to represent the ancestors in general. Personal objects from those you seek to honor or work with. Stones such as moonstone, emerald, quartz, fluorite, and others that enhance psychic ability.An offering plate and cup for libations and food offerings. A jar of Earth representing the living Earth from which all come and to which we all return. A glass of water to represent psychic forces and the water of the womb and body. A candle of memory or one to light when you conduct workings. A wand or dagger for directing energy. Incense to cleanse the space and carry your thoughts. A statue of a deity like Ceridwen, Arianrhod, Osiris, Anubis, or Ereshkigal, who are associated with afterlife and the dead. After this setup, a simple meditation or journey usually opens the gate of the already established bridge that we have with them as our ancestors. Follow any steps you have to prepare for meditation such as candle lighting, space cleansing, incense lighting, relaxing techniques, or Druid breathing exercises (Greer, 2006, pp. 213–217). This relaxed, centered, and grounded state is necessary to achieve optimal experience and not to lose focus when trying to talk with the ancestors. Meditating with an ancestor’s personal object is a great way to add extra connectedness to a specific ancestor when you are trying to establish a connection for the first time. If you have never meditated or done journey work (e.g., path workings or guided visualizations), it takes practice, but with dedication, this approach can yield strong results. Some people connect more easily and faster than others. Do not be dismayed if you do not see or experience anything on the first few tries. This is common, especially if you are doing a journey alone and are new to the whole experience. 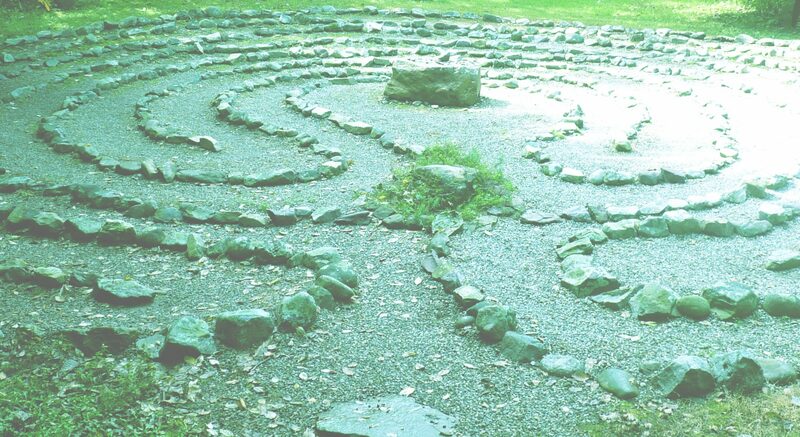 You will improve as you go through the first degree curriculum, as meditation is required on the Moon Path (AODA study program, 2015; Greer, 2006, p. 249). Here is a meditation I use frequently and that I have found works quite well. First, get com- fortable in a nice position (sitting or lying) before you begin. Next, state what your intent is, such as to see the ancestors, seek their wisdom, meet them, and so on. Once you get to that point of comfort, visualize yourself going within to your mind, into yourself, into the Earth, or into a new space specifically set aside in your mind for the ancestors. This can be accomplished with a few deep breaths in and out at a regular pace and feeling yourself go down into the Earth or into your mind. Envision yourself walking down a path that leads to a cave. Go inside the cave and see the light dissipate the deeper you go. You have a candle or light of a cell phone (twenty-first- century meditation). You know you are safe and that what awaits you at the deepest depths are the ancestors. You see the life that lies in the cave without the sun, such as fungi, spiders, blind newts, and bioluminescent plants. At the end of the cave is a door of elaborate design, carved with words and images. You know that behind the door awaits the stores of knowledge of the ancestors that you have the right to access. With a quick turn of the handle, you step through and into a room. This could be a library, a comfy room with chairs, a conference table, a park with a bench, or any other scene in which the ancestors choose to appear. Take time to announce your intent and what you are there for and to invite those who wish to help you in a positive way to come in and join you. Ask those spirits who wish to be negative to just walk on by. You will have any number of experiences, emotions, and feelings. You may find that animals, insects, or plants come to you—plants and animals you once cared for and whose lives you shared, or local spirits you may have passed by on the way to work or when walking in the woods. With people, do not expect those who have died that you know to be exactly the same in death. Often a shift in personality is common, as these spirits are wiser and have gained new experiences while out of this incarnation. Once you are finished there, travel back the way you came. Walk back through the door, out of the cave, passing all the life, and see the light of the sun increase. Continue back down the path to the waking world, and return to the grounded state. If you choose not to conduct a meditation, you can simply call on ancestors during rituals and rites, or honor their memory at a shrine. This is a different experience. This sets the tone for a general ancestor presence instead of a directed goal or with specific beings. In either case, you may experience recent or long-forgotten ancestors, the untraceable ones who existed long ago or far away. On a rare occasion you may even meet one from another life or planet you existed on, a more transcended connection from across the universe. Both methods are equally powerful and valid. If you are working with a specific ancestor, preparation of their favorite food, such as you would prepare for a deity or yourself, is the best practice for honoring the ancestors and making them happy. This extra effort shows dedication and intent that you are serious about having a healthy relationship with them. You can conduct ritual or honor ancestors at shrines in many ways. Sometimes they will tell you how they would like to be honored; sometimes they leave it up to you how best to express yourself. Whether we sing, drum, play an instrument, offer food, drink, or cigars, read poetry, or dance with them as in the Día de los Muertos celebrations of Latin culture, our lives shift when they come in, and we understand our place in the universe a little more. Once this relationship or practice is established, how do we fit it into our degree work? AODA’s literature contains no formal rites for ancestor workings (besides Samhain rituals). This does not mean one cannot adopt a practice for one’s own Druidry and degree work. One way you can incorporate ancestor work is through meditation as part of the Moon Path in the first degree curriculum, as it focuses and directs your attention, which is necessary for it to qualify for the curriculum. You may also use ancestor rites to explore spirituality, ritual, and mysticism as part of a Druidic exploration, also found in the first-degree curriculum (AODA study program, 2015). There is a great benefit to working with the ancestors, as Brown suggests: “The ancestors teach us about both the tenacity and fragility of life. Working with them invites us to look at ourselves anew, and with wonder. It gives reason to appreciate life as a precious sacred force and to respect it” (2012, p. 84). Each of us can work with our ancestors and access their stored wisdom; it is our right as living beings that have ancestors that preceded us. Whether you choose to make it part of the curriculum or just part of your personal Druidry, the ancestors will be there to guide you and give you the wisdom of the universe. Alvarado, D. (2009). Voodoo dolls in magick and ritual. CreateSpace. Brown, N. (2012). Druidry and the ancestors: Finding our place in our own history. Alresford, U.K.: Moon Books. Carr-Gomm, P. (2002). Druid mysteries: Ancient wisdom for the 21st century. London: Rider. from the southeastern Han Chinese. Chinese Sociology and Anthropology, 27(2–3), 57. Greer, J. M. (2011). The Druid grove handbook: A guide to ritual in the Ancient Order of Druids in America. Everett, WA. Lorain Press. Greer, J. M. (Ed.). (2011). The Druid Revival reader. Everett, WA: Starseed. Greer, S. (2014). Devotional practice. Trilithon, 1, 53. Hubbs, J. (1988). Mother Russia: The feminine myth in Russian culture. Bloomington: Indiana University Press. Hutton, R. (2009). Blood and mistletoe: A history of Druids in Britain. New Haven, CT: Yale University Press. LaGamma, A. (2007). Eternal ancestors: The art of the central African reliquary. African Arts, 40(4), 34. Lo, L. K. (2003). The nature of ancestral worship among Chinese Christians. Studies in World Christianity, 9(1), 35. MacMullen, R. (2010). Christian ancestor worship in Rome. Journal of Biblical Literature, 129(3), 602– 603. Mann, N. R., & Sutton, M. M. (2000). Druid magic: The practice of Celtic wisdom. St. Paul, MN: Llewellyn. Nichols, R. (1990). The book of Druidry. New York: Castle. Orr, E. R. (1998). Principles of Druidry. London: Thorson’s. Sahoo, K. (2014). Rituals of death in Odisha: Hindu religious beliefs and socio-cultural practices. International Journal of Language Studies, 8(4), 32–34, 37. Wippler, M. G. (1992). Powers of the Orishas: Santeria and the worship of saints. New York: Original. Zion, I. B. (2014, March 5). Israel reveals eerie collection of Neolithic “spirit” masks. Times of Israel.